“Malachite has many important healing qualities. It can help us to learn to trust the earth and the cycles of creation. Through the vibration of this stone we face life and feel that we can handle our experience on the physical plane. Malachite’s growth can remind us of more flexible ways of integrating structure and discipline, helping us to understand these functions that are vital to carry out projects. Working with Malachite helps us realize that we have the right to take our space in the world. “Malachite is an exquisite Oversoul that serves to attune our sense of connection and orientation on the Earth. To our eye, it appears as deep rich green, a complex series of geometric overlapping mandalas. When we pass through its center we enter the temple and are warmly greeted by six beings. The entire temple is carved from Malachite giving the whole atmosphere a warm green glow. We are asked to remain standing in silence and as we do so, the six beings surround us and form a six-pointed star. This geometry evokes something beautiful. Rising up through the floor appears a deva, which has an earthly elemental quality. 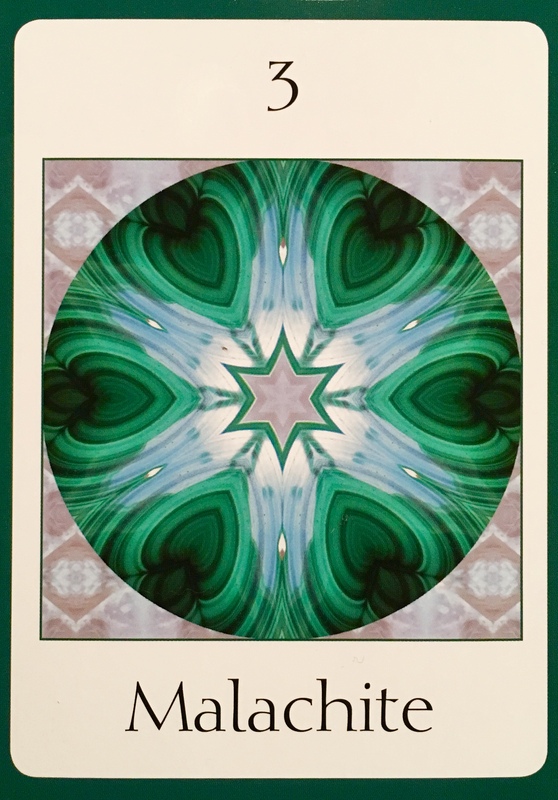 This deva works with the Malachite Oversouls to enrich the earth star connection. The deva telepathically show us any codes we might carry in the base chakra that are inhibiting the flow of our life force. The deva begins to focus its light on our base, sings and its song stirs within us an ancient calling that opens and strengthens the base chakra and aligns it to new frequencies of trust. “Malachite is copper carbonate mineral with a monoclinic crystal system and a hardness of 3.5-4. Its name comes form the Greek world for its color, Malache (mallow). Good Malachite is found in Russia and Africa. Malachite is one of the most important stones for protection from negative energies. It permeates the auric field with positive vibrations and strengthens the natural energetic “shell” which can screen out hostile forces, and it activates the “psychic radar” with which one feels the presence of danger. It even accentuates the sort of protection in which synchronicities seem to conspire to keep one safe. Malachite emanates the healthiest energy pattern for the heart. It assists one in maintaining emotional balance, and it offers an enhanced ability to see and avoid one’s own emotional pitfalls. The Solar Plexus Chakra is stimulated by Malachite, enhancing one’s willpower. In the presence of Malachite, it is easier to refuse temptations. Malachite instills confidence and responsibility and it is useful in making spiritual progress through right action. Malachite is a stone of the Root or Base Chakra, and it is also a stone of the Solar Plexus and the Heart Chakras. This means that it helps us to alleviate fears while also opening our hearts and empowering us to have confidence in ourselves; an extremely healing combination. It’s swirling patterns of green are magical, and can be used as an aid in visual meditation. When wearing malachite, it is important to have a nicely polished piece, as the rough specimens can be fragile and are thought to contain toxic minerals that must never be ingested. That being said, it is a safe mineral to wear or handle in it’s polished state and many people wear Malachite pendants, earrings, rings and bracelets with no health issues. If you are concerned, you can place your polished specimen in front of you while meditating, in a mesh baggie or place it beside your bed or under your pillow. It can also be placed for specific healing on various parts of the body, particularly on the Heart or Solar Plexus Chakras or anywhere that needs immediate healing. If you are concerned, simply place it over clothing and you will still receive the maximum benefits of the vibration of the stone. Malachite is a great stone to wear at this stressful time of year, even though it is supposed to be cheerful and loving, we all know that we spend quite a bit of it fighting over parking spots at the mall and avoiding nasty people in store lineups! Maybe we have toxic relatives that we manage to avoid the rest of the year, or are feeling pressured to socialize in uncomfortable group settings. Whatever the case may be, Malachite can be a wonderful Ally in keeping us safe and protected from negativity while healing our fears and adding strength, courage and vitality to our physical and emotional bodies. Hello, I stopped getting your emails a few days ago. Why? I miss your post, yesterday and today. Hope you are doing well and you will post soon.